The STS-107 crew. Front from left: Rick Husband William McCool. 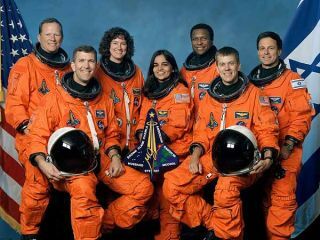 Standing from left: David Brown, Laurel Clark, Kalpana Chawla and Michael Anderson and Ilan Ramon. CAPE CANAVERAL, Fla. — Astronauts and flight controllers responsible for space shuttle Columbia's upcoming 16-day science research mission said Friday they are ready to go as soon as NASA managers say it's safe to fly. Tiny cracks recently found in the plumbing within the main propulsion system of space shuttles Atlantis and Discovery forced the space agency to put the Columbia's flight on hold until engineers could examine Columbia and troubleshoot here sister ships' problem. The launch of STS-107, an extended duration mission, has been delayed at least a few weeks — a development the seven-member crew is taking in stride. "We have had a fair number of slips through the course of our training but we've made good use of those," said mission commander Rick Husband. "This will be no different." Originally set to blast off in June 2000, schedule changes and the need to use Columbia on a higher-priority mission to service the Hubble Space Telescope contributed to this crew's lengthy wait. Once in space, the five men and two women will divide into two teams and spend 14 days working around-the-clock to carry out some 80 investigations that touch on a number of science disciplines. "The themes of the mission are many and varied," said John Charles, a NASA mission scientist overseeing the biological experiments planned for the flight. Among the ambitious research planned is a look at the way dust from deserts can be blown into Earth's atmosphere and travel around the planet, as well as studies of the way combustion takes place in microgravity with an eye toward reducing the amount of soot produced. Some of the experiments are provided by Israel's space agency and will be operated by that nation's first astronaut, Ilan Ramon. The son of a Holocaust survivor, Ramon has been training four years for this flight. Given the events of Sept. 11, 2001 and the current situation in Israel, Ramon's presence on the mission has raised security concerns to a new level, not only for the shuttle and the crew but for everyone associated with the flight in Florida and Texas. "Ever since Sept. 11, just like everybody else across the world, we've stepped up our security measures and we're confident we have taken the appropriate measures," said STS-107 lead flight director Kelly Beck.